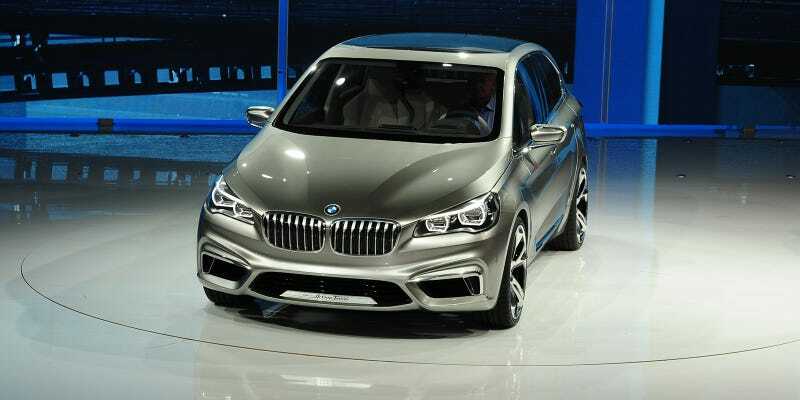 The BMW Concept Active Tourer should be considered heresy by BMW fanboys. It's a plug-in hybrid. It has three cylinders. And most of all, it's front-wheel drive. But, worst of all for those BMW fans? It looks pretty great. We've already seen pictures of the Concept Active Tourer, or CAT as BMW is now calling it internally. Frankly, the office was divided. I thought it looked pretty nice for a city car, while a one Mr. Orlove was not really all that enthused. After seeing it in person, I have to say my opinion hasn't changed. This car is handsome. As a reminder, this plug-in hybrid is powered by a turbocharged three cylinder engine, has a glass roof, and I can say with almost metaphysical certitude that it will be built as some sort of 1-Series GT. But do you like it and should BMW be building a front-drive car? Let us know in Kinja below these pictures.